After The English Monster, one of the most frightening and extraordinarily curious historical novels I read last year (review here), I wondered what The Poisoned Island would have in store for me. Set not long after the events of its predecessor, the chilling and true life Ratcliffe Highway Murders in the early 19th century, The Poisoned Island takes London magistrate John Harriott and his constable Charles Horton on to their next big case. The vessel the Solander returns to London’s docks in 1812. It has become less ship than hothouse, its timbers near bursting with the fruits of its botanic expedition to Tahiti, or Otaheite as the crew know it. Sir Joseph Banks, friend of mad King George III and creator of the collections of Kew, has financed the voyage to the paradise islands he himself visited many years ago, long before he was crippled with age, obesity and lameness. But when the crew disembark into the inns and pauper streets of London, some carry a secret with them. It’s not long before a number of them are found dead, their throats slit or their necks stretched, and all with a smile on their face, an ugly grimace suggesting they met their deaths with happiness, even ecstasy. While Harriott and Horton (especially Horton) follow the blood-spattered, pungent clues across the poorer parts of London, Sir Joseph Banks with his librarian Robert Brown greets his green gifts from Tahiti, planting them with care, noting their names and their potential to science. There is one plant above all others that captivates Banks and Brown – an unknown bread plant, adorned with only female flowers, and possessed of the ability to grow at an unnatural rate. While Horton must puzzle at the secrets carried within the minds and sea chests of the crew, we are left to immerse ourselves in the mystery of England’s dealings with Tahiti. The chapters in London mix with scenes set on Tahiti, focusing on a young native prince whose dream is to travel to England – the islands of iron. But Tahiti is a collection of islands poisoned by its contact with Europeans – the lechery of the crews spreads the pox, decimating the population, women bought with iron nails. Tahiti itself is robbed by the English. Its bread plant is taken to feed the monster of slavery in the west while its more exotic riches are destined for Kew. To some, Tahiti is a paradise, to others it is a place of disease, human sacrifice, ritual, loss. But should a Tahitian reach London, he too would find a poisoned island, corrupt, poor, greedy, murderous. Tahiti to many, though, is the haven of mutineers. Although The Poisoned Island features the same principal characters as The English Monster – Harriott, Horton and others – it is a standalone novel and it isn’t necessary to have read The English Monster first, although I would recommend that you do so. Both novels are highly original but they are very different from each other. The English Monster is a terrifying mix of history and horror. Its structure is unconventional and its London, despite the murders being true life, dark and walked by demons. The Poisoned Island is built around fictitious murders but its structure is more linear and, at least for me, its horror element has been tempered by something no less sinister and threatening but much more tangible. As a reader who struggles with horror, I liked that. The danger is no less and neither is its mystery but it has become more integrated into the story and timeline. As a result, I was given a historical mystery that I was able to become more involved with, that had a linear pace that gathered momentum, and frightened me without distancing me. Having said all that, I wouldn’t have changed a word of The English Monster. 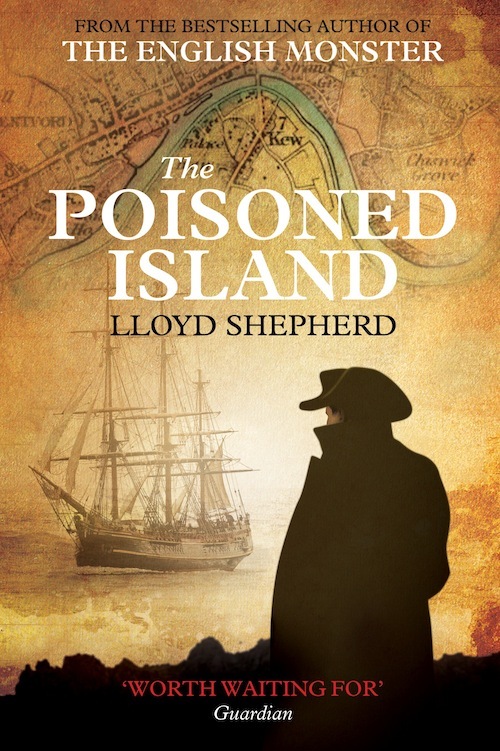 In The Poisoned Island we learn a little bit more about the curious Charles Horton, whose mysterious past haunts him still, and his intelligent and free-spirited wife, Abigail. It is easier to get to know the characters here, although, just as before, they are surrounded by wonderful, exhilarating and ugly London lives. ‘There are more things on this earth than are dreamt of by our natural philosophy’ says Sir Joseph Banks, a representative of the Great Enlightenment that in these days saw English hunger for self-improvement flourish on an industrial scale at the expense of many. But, as Sir Joseph learns, the English monster will not necessarily have everything its own way. The Poisoned Island is a fabulous novel that I could barely put down over the last two days. Murder mystery, historical retelling, supernatural tale, it is a thoroughly fascinating and gripping look at the more sinister side of the famous Georgian sea journeys of discovery as well as the more suspect origins of the great botanic collections of Kew Gardens. This isn’t my favourite period of history, far from it, but if there’s any author that makes me want to know more about it, it’s Lloyd Shepherd. More, please! This entry was posted in Historical Fiction, Horror, Review and tagged Historical fiction, Horror on June 10, 2013 by Kate (For Winter Nights). I also loved the English Monster and ordered it following another of your delightful reviews. I have just ordered Poisoned Island and look forward to the journey. Keep up the good work Kate I love reading the reviews.